Conversational AI made traction into many areas in 2018 with a growing number of businesses moving toward harnessing the power of conversational AI for a more diverse set of use cases, to increase productivity and drive higher performance across marketing, sales, and other organizations. 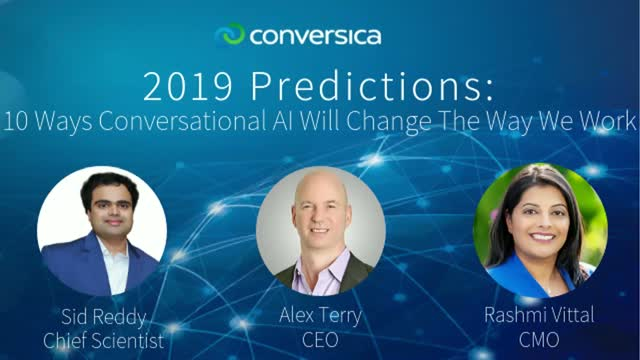 Watch our exclusive 2019 Predictions video fireside chat featuring Conversica CEO Alex Terry and Conversica Chief Scientist Sid J. Reddy, as they discuss the 10 ways that Conversational AI will evolve in 2019. Moderated by Conversica CMO Rashmi Vittal. Every CRM has a number of leads that are old and unresponsive. Do you throw them away or let them sit there? (Hint - neither is the answer). Learn how to make old leads work for you in this webinar featuring Kris Saim-Gentry, Marketing Director at Sunlighten, and Nancy Nardin, Founder and CEO of Smart Selling Tools. You'll also receive a demonstration from Conversica on how to engage prospects and close more deals with an AI Assistant. For the third year in a row, Conversica commissioned an in-depth study tracking lead follow-up efforts of B2B and B2C companies across a number of different industries. In 2017, we found that a staggering 77% of companies under-touched their leads. Join us for a webinar with Nancy Nardin of Smart Selling Tools and Matt Heinz of Heinz Marketing, as they discuss the state of lead follow-up and what businesses can do to improve inbound lead follow-up. The Demand Unit Waterfall is a powerful guiding tool for marketers, but it’s completeness leads to a complexity that was, until now, inherently impossible to manage completely. The good news is that Artificial Intelligence (AI) services have emerged that empower marketers to wrestle down complexity and maximize throughput of qualified leads to Sales. Learn how A.I. powered business conversations create more opportunities with Conversational A.I.